Storm Team4 Chief Meteorologist Doug Kammerer says snow could be falling during the Friday morning rush and more snow is expected next week. The sunny, balmy weather of Thursday is so over. And coming in its place? Nasty cold. Rain. Even SNOW -- and possibly a lot of it, especially for March. Winter is back, and it has some making up to do. 1. The warmth won't stick around. We’ve already had days that felt like spring, but those temperatures are plummeting this weekend. “Cold and arctic air is moving down from Canada,” said Storm Team4 Chief Meteorologist Doug Kammerer. The cold will move in Friday morning, and snow is possible during the morning rush, especially north and west of D.C.
Wind chills Saturday morning will be in the teens and -- brrr -- single digits. That's not good news for those of you running the Rock and Roll Marathon this weekend -- or anyone with outdoor plans. 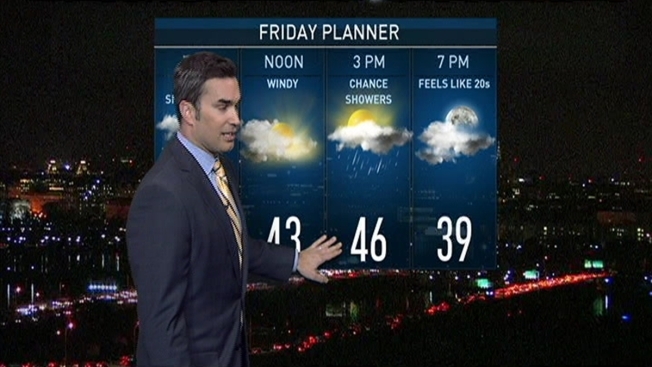 SEE latest conditions, radar and an hour-by-hour forecast here. 2. That's also bad news for Cherry Blossoms. Many people were excited about the unseasonably warm weather because it put cherry blossoms on track for an early bloom, according to the National Park Service. But the temperature drop heading our way puts the blooms in danger. Chief Meteorologist Doug Kammerer warns that if temperatures drop to a hard freeze, the cherry blossoms could die. “Temperatures dropping below 28 degrees, which is a hard freeze, brings the potential to kill the cherry blossoms,” Kammerer said. The most important number to watch is just how low the temperatures go this weekend, which will determine how many of the blossoms can survive. READ complete coverage of the Cherry Blossom bloom and festival here. 3. SNOW. We said it: REAL SNOW. You might have to pull out your snow boots and winter jacket because snow could be heading our way. “We’ve got the potential for a storm on Monday night into Tuesday,” Chief Meteorologist Doug Kammerer said. It's too far out to be certain, or to say how much snow the region might get. But models are suggesting the snow could be significant, particularly for March, if the current track continues. Expect Storm Team4 to issue updates on the threat as Tuesday approaches. 4. And yet -- warmth and drought have led to wildfires. Even with the threat of rain or snow in the future, the region is in a drought. That's led most of the D.C. area to be at a higher risk for fire. Making matters worse: winds that have been sweeping the area for the past few days. A brush fire broke out on the outer loop of the beltway in Silver Spring Thursday.